The performance of a low-cost partially integrated cantilever-based airborne nanoparticle (NP) detector (CANTOR-1) is evaluated in terms of its real-time measurement and robustness. The device is used for direct reading of exposure to airborne carbon engineered nanoparticles (ENPs) in indoor workplaces. A comparison among three methods for the calibration of tri-axial MEMS accelerometers is presented, paying attention to the uncertainty assessment of each method. The first method is performed according to the ISO 16063 standards. Two innovative methods are analysed, both suitable for in-field application. For each method, the main contributions to the measurement uncertainty have been identified and evaluated, in order to define their most suitable field of application. Low-frequency vibration measurements are of great interest in many fields like energy production, structural health monitoring (SHM) of buildings, geotechnical applications, human vibration and bio-dynamics, mainly because of the increasing development of MEMS embedded in mobile devices and in applications in the field of the Internet of Things (IoT). We investigated the effectiveness and efficaciousness of some available calibration techniques to promote their aware, widespread, use. This article introduces a new idea for a micro vacuum sensor. The measuring principle of the sensor is to measure the electrical conductivity of the residual gas in a vacuum chamber. The conductivity is measured between two electrodes that are only 300 nm apart. It has been shown that this type of sensor allows vacuum pressure measurement from atmospheric pressure to high vacuum at very low voltages. In the presented paper, authors introduced examples of continuous wavelet analysis of load spectra recorded with MEMS gyroscopes during the flight testing. The analysis could be applied for aeroplane load analysis during the flight based on data from simple recorder unit. The other potential application of this method would be academic education. The courses of data analysis, handling qualities or flight testing seem to be still uncommon in aerospace engineering studies. This paper presents a new wearable gesture interface which is intuitive, fast, accurate, and convenient with MEMS sensors and ZigBee independent of cameras, sensor bars, and surfaces in a broader interactive range. This kind of spatial interaction tool can help more people to express anything through gesture movement. Current gesture interaction mainly works on recognition, while our product applies novel and systematic calculation and realizes more flexible and accurate gesture interaction. Al horr, Y., Arif, M., Katafygiotou, M., Mazroei, A., Kaushik, A., and Elsarrag, E.: Impact of indoor environmental quality on occupant well-being and comfort: A review of the literature, International Journal of Sustainable Built Environment, 5, 1–11, https://doi.org/10.1016/j.ijsbe.2016.03.006, 2016. Bausells, J.: Piezoresistive cantilevers for nanomechanical sensing, Microelectron. Eng., 145, 9–20, https://doi.org/10.1016/j.mee.2015.02.010, 2015. Bertke, M., Hamdana, G., Wu, W., Marks, M., Wasisto, H. S., and Peiner, E.: Asymmetric resonance frequency analysis of in-plane electrothermal silicon cantilevers for nanoparticle sensors, J. Phys.-Conf. Ser., 757, 12006, https://doi.org/10.1088/1742-6596/757/1/012006, 2016. Bertke, M., Hamdana, G., Wu, W., Wasisto, H. S., Uhde, E., and Peiner, E.: Analysis of asymmetric resonance response of thermally excited silicon micro-cantilevers for mass-sensitive nanoparticle detection, J. Micromech. Microeng., 27, 64001, https://doi.org/10.1088/1361-6439/aa6b0d, 2017a. Bertke, M., Wu, W., Wasisto, H. S., Uhde, E., and Peiner, E.: Size-selective electrostatic sampling and removal of nanoparticles on silicon cantilever sensors for air-quality monitoring, in: 2017 19th International Conference on Solid-State Sensors, Actuators and Microsystems (TRANSDUCERS), 2017 19th International Conference on Solid-State Sensors, Actuators and Microsystems (TRANSDUCERS), Kaohsiung, Taiwan, IEEE, 1493–1496, 2017b. Brand, O., Dufour, I., Heinrich, S. M., and Josse, F.: Resonant MEMS: Fundamentals, Implementation and Application, edited by: Brand, O., Dufour, I., Heinrich, S. M., and Josse, F., Advanced Micro & Nanosystems, Wiley-VCH, Weinheim, Germany, 2015. Chu, C.-C., Dey, S., Liu, T.-Y., Chen, C.-C., and Li, S.-S.: Thermal-Piezoresistive SOI-MEMS Oscillators Based on a Fully Differential Mechanically Coupled Resonator Array for Mass Sensing Applications, J. Microelectromech. Syst., 27, 59–72, https://doi.org/10.1109/JMEMS.2017.2778307, 2018. Corigliano, A., Ardito, R., Comi, C., Frangi, A., Ghisi, A., and Mariani, S.: Microsystems and Mechanics, Procedia IUTAM, 10, 138–160, https://doi.org/10.1016/j.piutam.2014.01.015, 2014. Hees, J., Heidrich, N., Pletschen, W., Sah, R. E., Wolfer, M., Williams, O. A., Lebedev, V., Nebel, C. E., and Ambacher, O.: Piezoelectric actuated micro-resonators based on the growth of diamond on aluminum nitride thin films, Nanotechnology, 24, 25601, https://doi.org/10.1088/0957-4484/24/2/025601, 2013. Li, X. and Lee, D.-W.: Integrated microcantilevers for high-resolution sensing and probing, Meas. Sci. Technol., 23, 22001, https://doi.org/10.1088/0957-0233/23/2/022001, 2012. Mathew, R. and Ravi Sankar, A.: A Review on Surface Stress-Based Miniaturized Piezoresistive SU-8 Polymeric Cantilever Sensors, Nano-Micro Lett., 10, 25, https://doi.org/10.1007/s40820-018-0189-1, 2018. Moreno-Rangel, A., Sharpe, T., Musau, F., and McGill, G.: Field evaluation of a low-cost indoor air quality monitor to quantify exposure to pollutants in residential environments, J. Sens. Sens. Syst., 7, 373–388, https://doi.org/10.5194/jsss-7-373-2018, 2018. Pérez Sanjurjo, J., Prefasi, E., Buffa, C., and Gaggl, R.: A Capacitance-To-Digital Converter for MEMS Sensors for Smart Applications, Sensors (Basel, Switzerland), 17, 1312, https://doi.org/10.3390/s17061312, 2017. Sviličić, B., Mastropaolo, E., and Cheung, R.: Piezoelectric sensing of electrothermally actuated silicon carbide MEMS resonators, Microelectron. Eng., 119, 24–27, https://doi.org/10.1016/j.mee.2014.01.007, 2014. Toledo, J., Jiménez-Márquez, F., Úbeda, J., Ruiz-Díez, V., Pfusterschmied, G., Schmid, U., and Sánchez-Rojas, J. L.: Piezoelectric MEMS resonators for monitoring grape must fermentation, J. Phys.-Conf. Ser., 757, 12020, https://doi.org/10.1088/1742-6596/757/1/012020, 2016. Wasisto, H. S., Zhang, Q., Merzsch, S., Waag, A., and Peiner, E.: A phase-locked loop frequency tracking system for portable microelectromechanical piezoresistive cantilever mass sensors, Microsyst. Technol., 20, 559–569, https://doi.org/10.1007/s00542-013-1991-9, 2014. Wasisto, H. S., Merzsch, S., Uhde, E., Waag, A., and Peiner, E.: Handheld personal airborne nanoparticle detector based on microelectromechanical silicon resonant cantilever, Microelectron. Eng., 145, 96–103, https://doi.org/10.1016/j.mee.2015.03.037, 2015. Wasisto, H. S., Uhde, E., and Peiner, E.: Enhanced performance of pocket-sized nanoparticle exposure monitor for healthy indoor environment, Build. Environ., 95, 13–20, https://doi.org/10.1016/j.buildenv.2015.09.013, 2016. Xu, J., Bertke, M., Li, X., Mu, H., Yu, F., Schmidt, A., Bakin, A., and Peiner, E.: Self-actuating and self-sensing ZNO nanorods/chitosan coated piezoresistive silicon microcantilever for humidit Y sensing, in: 2018 IEEE Micro Electro Mechanical Systems (MEMS), 2018 IEEE Micro Electro Mechanical Systems (MEMS), Belfast, IEEE, 206–209, 2018. Zhao, C., Wood, G. S., Pu, S. H., and Kraft, M.: A mode-localized MEMS electrical potential sensor based on three electrically coupled resonators, J. Sens. Sens. Syst., 6, 1–8, https://doi.org/10.5194/jsss-6-1-2017, 2017. Zuo, C., Sinha, N., van der Spiegel, J., and Piazza, G.: Multifrequency Pierce Oscillators Based on Piezoelectric AlN Contour-Mode MEMS Technology, J. Microelectromech. Syst., 19, 570–580, https://doi.org/10.1109/JMEMS.2010.2045879, 2010. 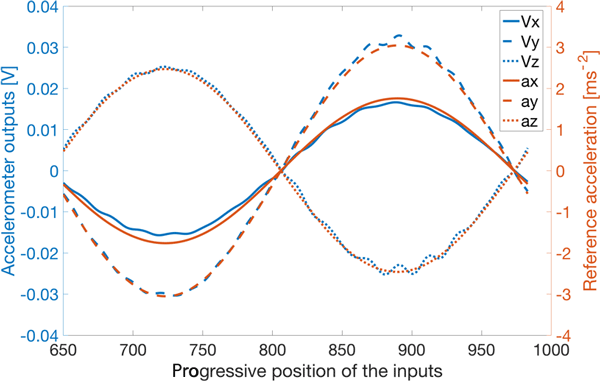 In this work, methods to reveal a symmetrical amplitude shape from the asymmetric behavior in thermally actuated piezoresistive cantilever sensors are proposed. The symmetrical amplitude shape should then be accompanied by a monotonic phase response. With the monotonic phase response, real-time frequency tracking can be easier to implement using a phase-locked-loop (PLL) system.